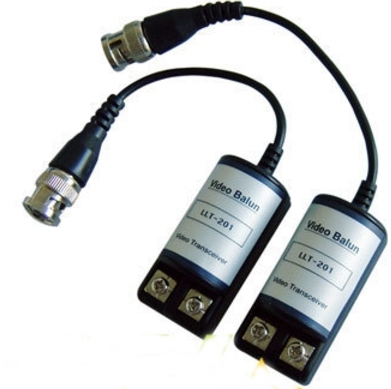 Video Balun (passive video baluns) - improves signal quality, and allows you to connect a cctv camera to cat5 by simply loosening the 2 screws, place one piece of wire under each metal plate and tighten the screws. The balun has a bnc connector at each end to attach to a cctv camera and also dvr. Allows you to send the signal from any cctv camera up to 300 meters along a phone cable (cat5/cat6 cable). Boosts signal and cuts out noise and visual interference. Simply connect one balun at each end of a cable. Can allow you to run 4 cameras down a cat5 (phone) cable. These are high quality baluns and not the inferior quality type with the 2 input holes.